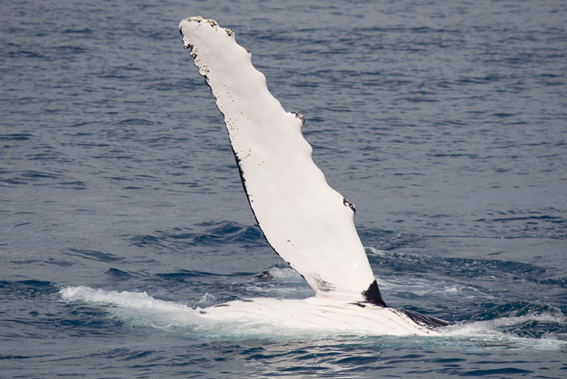 What a spectacular winter we’ve had here at Kingfisher Bay and on Fraser Island – temperatures in the high 20s and 30s; an abundance of sunshine and blue skies and stunning conditions on the Great Sandy Strait to kick off the 2013 Humpback Whale Watching season. The dry, wind-free conditions have been perfect for Queensland Parks and Wildlife to conduct their annual controlled burns on the island (and indeed around Queensland). These ‘burn offs’ are vital in reduce the fuel load and preventing the potential major bush fire. But they also serve a greater purpose to fertilising the ground and increasing the number and variety of young plants. Near perfect conditions on the Great Sandy Strait have resulted in nothing short of a PECtacular start to the Humpback Whale Watch season. Recently, our gentle giants of the deep graced Australian television screens with a special story which aired on popular current affairs show, Sixty Minutes. 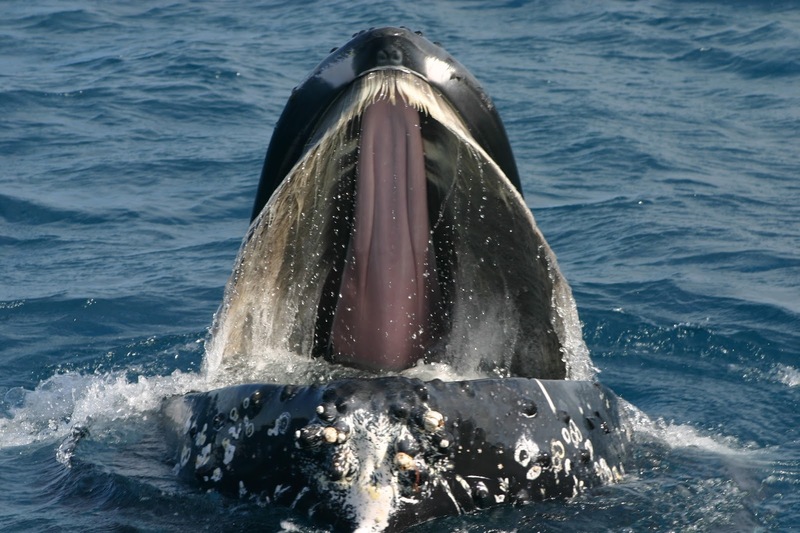 DID YOU KNOW that Humpback Whales are the most surface active of all the great whales? 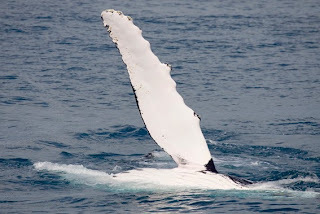 And in keeping with their nature, the Hervey Bay Humpbacks have been putting on a show for the flotillas of whale watching boats out in the sheltered water between the mainland and Fraser Island. Some of their most dramatic behaviour includes breaching – where the whale propels two thirds of its stocky body out of the water – then falls back with an almighty splash and Peduncle slaps – where the flukes and peduncle (area from the dorsal fin to the tail) are thrown out of the water and slapped down. Equally as exciting are the close up encounters. And from the Ranger team, it’s been a pretty action-packed month for Luke in our resort's Jetty Hut. Whilst this talented musician is best known for serving up fishing advice, bait, tackle and sun downers in our water sport hub, his environmental skills were called in to action when one of the island’s non-venomous Carpet Pythons (Morelia spilota mcdowelli) decided to sun itself on a resort building. 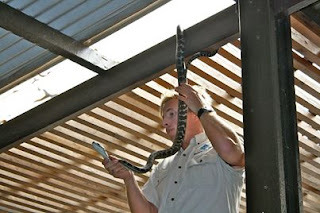 Luke spent 20 minutes gently ‘wrangling’ the python before relocating it to a nearby forest. Most of this slippery specimens are olive green, with pale, dark-edged blotches, stripes or cross-bands and feed on lizards, frogs, birds and mammals here on Fraser - so the snake in question will be quite happy in its new home. Luke’s actions were followed by resort guest, Madia Botha, who recorded the whole thing on her camera and sent us this pic. And finally, as we move towards the September school holidays (check out our Junior Eco Ranger program) and the start of Fraser Island Dingo (Canis lupus dingo) whelping season – a time when young pups learn natural hunting and survival skills – it’s a great time to issue a timely reminder about being Dingo safe in the Great Sandy National Park. Queensland Parks and Wildlife Service’s Fraser Coast area manager, Steve Price, tells us that we can expect to see dingo pups venturing out of their den and exploring their surrounds and mums will be protective. At this time of year, females, that are feeding young, can lose condition and become naturally lean during this time. Until next blog, enjoy your time in the outdoors Tree Huggers and happy holidays.